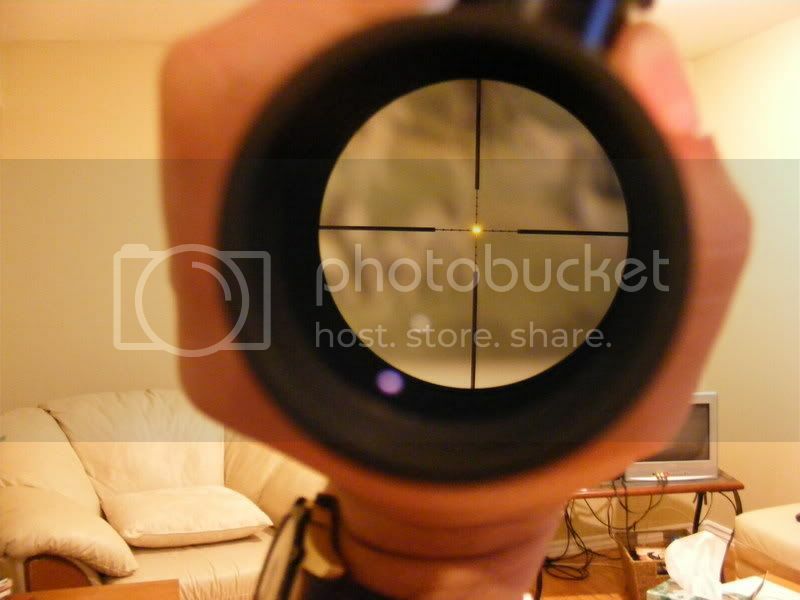 ﻿ HuntingNut » Forums » Firearms, Shooting & Reloading » Gun & Firearm Discussions » Got my Scope! Posted: Tue Oct 21, 2008 4:51 pm Post subject: Got my Scope! 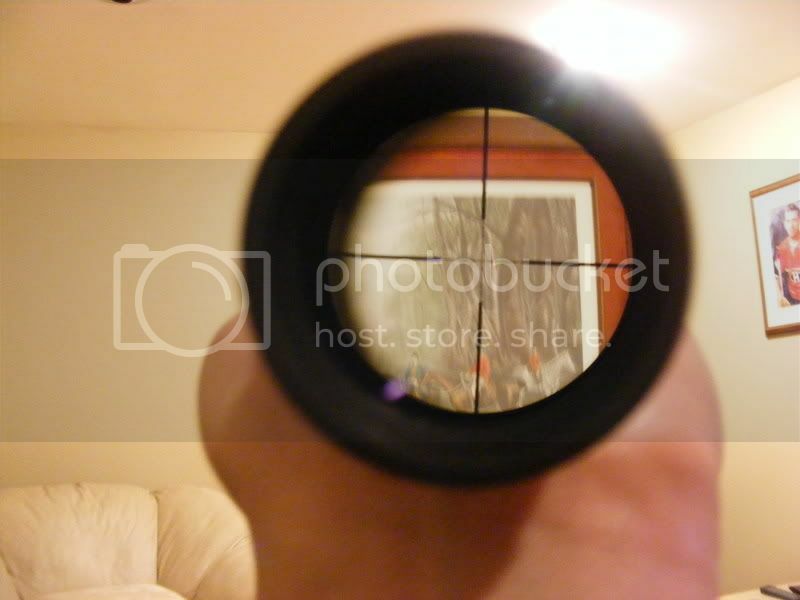 Well I have the scope for my M1A. 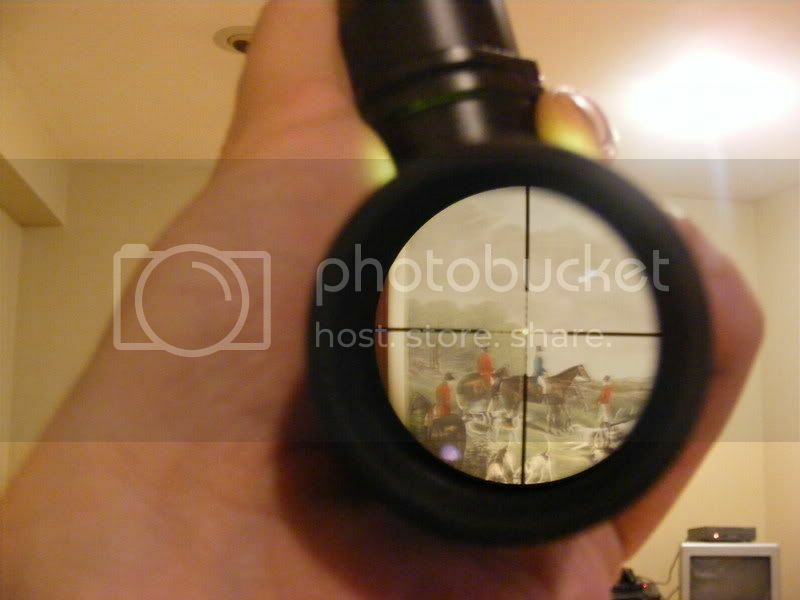 A Trijicon TR20-2 AccuPoint Rifle Scope. After alot of thought I ordered this one 4 weeks ago and now I have it! Its your standard 3 to 9 magnification scope with a Mil-Dot style reticule (works at the 9th magnification power) and a 40mm objective lens. Adjustments are made as with any other non-"tactical" scope. Removing a cover will expose the dial. Lifting the dial will allow you to set it to zero once sighted in. 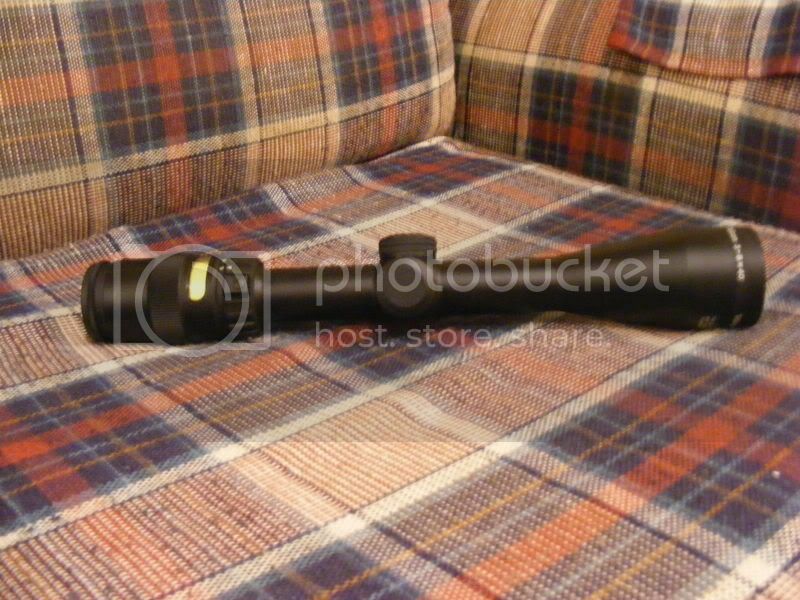 Its unique feature, also featured on the Trijicon line of ACOG optical scopes is the way it illuminates the rifle scope's reticule. It uses fiber optics in the day and at night it has a small vial of Tritium to light up the reticule. Normal ambiant light. Illumination not needed. Very tiny dot. Illuminated needed using a simulated bright day (with a flash light on the fiber optics. At 3 times magnification. And at 9 times magnification. Now I have the gun, scope mount, scope and need to select rings. Will get back to you in a month or so. Posted: Tue Oct 21, 2008 6:11 pm Post subject: Re: Got my Scope! What scope mount are you using? I just put the ARMS 18 on my M1A and love it. Looks like a nice scope by the way. Posted: Tue Oct 21, 2008 6:25 pm Post subject: Re: Got my Scope! Posted: Wed Oct 22, 2008 1:39 pm Post subject: Re: Got my Scope! The nice couch and Scottish clotch. What is your clan? Some High Hill? 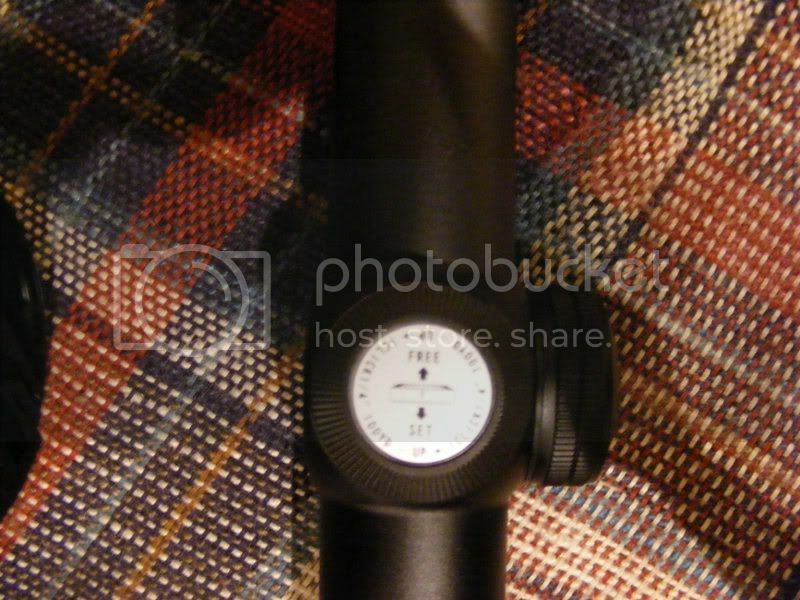 Posted: Wed Oct 22, 2008 2:11 pm Post subject: Re: Got my Scope! Nope no Scottish in me. And although I have dated many Scottish lasses (girls incase you don't know) I do not believe I have any kids who are Scottish. Posted: Wed Oct 22, 2008 5:21 pm Post subject: Re: Got my Scope! Posted: Wed Oct 22, 2008 8:26 pm Post subject: Re: Got my Scope! Saying anything more will only serve to embarrass myself or make a mockery of myself if I reply to the "Denial" statement therefor I will shut it. I think I already said too much! Posted: Wed Oct 22, 2008 11:18 pm Post subject: Re: Got my Scope! how does it perform at night outdoor by star/moon light? Posted: Thu Oct 23, 2008 1:41 am Post subject: Re: Got my Scope! Your new scope looks great 'Mitri...now all ya gotta do is get it mounted and zeroed mate...then get out there and do some huntin'. Nice couch mate...how many flannellette shirts did it take to cover it mate? Posted: Thu Oct 23, 2008 3:47 am Post subject: Re: Got my Scope! Posted: Thu Oct 23, 2008 4:35 am Post subject: Re: Got my Scope! Haven't tried that yet since night hunting is illegal it wasn't really something I thought about. Posted: Thu Oct 23, 2008 7:38 am Post subject: Re: Got my Scope! D, what kind of rings are you looking at? If I had my "druthers" I think I'd use one of the "quick detach" types on a rifle like that. Posted: Thu Oct 23, 2008 9:16 am Post subject: Re: Got my Scope! Nice Scope D, I've looked at them too. Love the Mill Dot. In your fourth pic, was that Bushy on one of those Horses? Posted: Thu Oct 23, 2008 10:12 am Post subject: Re: Got my Scope! Posted: Thu Oct 23, 2008 10:58 am Post subject: Re: Got my Scope! Nice pics...now get some with some 'dinner' in the cross-hairs.